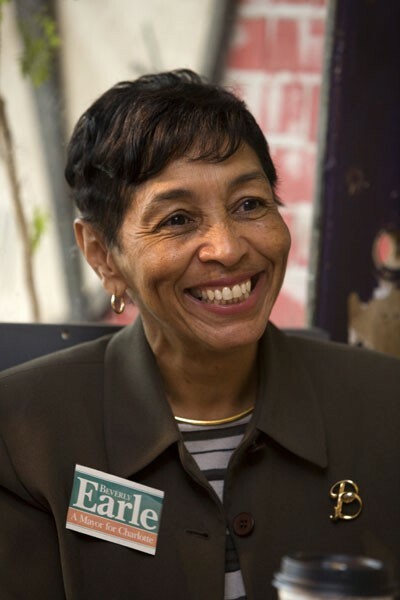 Can Beverly Earle defeat Pat McCrory and become Charlotte's next mayor? Click here to see a list of Beverly Earle's contributors – and how much they donated. Beverly Earle is running hard for the mayor's office. When I arrive five minutes late for an interview with the Democratic mayoral candidate at a coffeehouse in NoDa, she's hunkered down in a small booth, talking on her cellphone. It's only 10 a.m., but our meeting isn't the first one she's had today, and it isn't even close to being her last. The Smelly Cat Coffeehouse was picked for our talk because it's near the location of her next meeting; she'll meet with a group of supportive church members, followed by a confab with other civic groups. And that's just before lunch. "OK, I have to run," Earle tells the person she's talking to, hangs up, and smiles as she shakes my hand. Sitting there in a stylish, dark-green outfit, eyes sparkling, Earle radiates a surprising level of confidence and fire, especially for a candidate who, having hardly gotten out of the gate, has already been raked over the coals by the Observer for minor finance reporting oversights. Her recent experience with the press is evidently on her mind when she says, chuckling, "Pleased to meet you ... I think." I ask, "Are you this busy every day?" "Oh, yeah," she replies, "I'm always busy. Running for mayor is definitely a full-time pursuit. But I don't mind." We're both pressed for time, so I get down to brass tacks. "Are you going to have enough money to be competitive in the race?" Earle, who is currently serving her seventh term as a state legislator, replies, "I won't have the money that McCrory has built up. I haven't had the opportunity to be out there campaigning as long as he has, but we're getting good support, even from some of the same folks who've supported him. I don't have to spend the kind of money he'll be spending. Democrats have a long history of winning grassroots campaigns, so I'm out everywhere, building support. I'm seeing a lot of excitement; we'll have a good get-out-the-vote effort, so yes, we're definitely going to be competitive." Earle is a native of Greensboro, but has lived in Charlotte for 27 years. She recently retired after working for BellSouth. When I ask her if she'll be campaigning in predominantly white areas of town, she looks surprised at the question. "Oh yes, of course," she says quickly, "this is a citywide campaign, and I definitely will be doing that. My whole career, I've shown that I can work across party lines and across racial lines. When I was representing the north end of the county, I was elected three times, and we didn't talk about race, we talked about issues. In Raleigh, I've worked with Republicans very efficiently. I'm running to be mayor of the whole city, and I'm hearing from a lot folks in predominantly white areas of the city who are supporting me." So, why does she want to be mayor rather than continuing in Raleigh? "I think I can make a big difference here," she replies. "And I believe Charlotte city government needs to be run in a way that's different from how it's been run under Pat McCrory. We need to have more cooperation between groups and governmental organizations that can help the whole city thrive, and I can do that much better than it's been done lately." "Can you give me more specifics?" "The neighborhoods are the most obvious issue. Everywhere I go, I'm hearing that McCrory hasn't been as responsive to the neighborhoods' concerns as he has been to Uptown Charlotte. I think there needs to be a balance. We certainly need the economic development that comes with Uptown, and business and growth. But we also need to keep our neighborhoods vibrant. That's what great cities do. Charlotte is prospering, and I feel that we need to be sure that all of Charlotte is sharing in that prosperity, and that's certainly not the way it is now. When you are the mayor, you should be concerned about the entire city." Earle and her supporters say Mayor Pat McCrory has been good for Uptown business development, which they have no problem with. But, after six terms of ignoring much of the city, they claim, the city desperately needs a change. Earle's co-campaign manager Michael Evans says Charlotte's west side corridor and east side corridor -- which McCrory said contained "corridors of crap," after the murder of two police officers on the east side in April -- had been ignored too long. Evans suggests that Earle would like to help coordinate the start of "a Central City Partners type group for other parts of the city." McCrory says Earle is mistaken. "She doesn't have her facts right," the mayor said. "We've approved tens of millions of dollars in bonds to help neighborhoods during my tenure -- more than ever in the city's history. She needs to check the facts." The mayor, confident as ever, added, "If she could get the state to get someone to pick up litter in those corridors, that would be great," followed by the zinger, "And if she'd help us get more prosecutors, that would be appreciated, too."